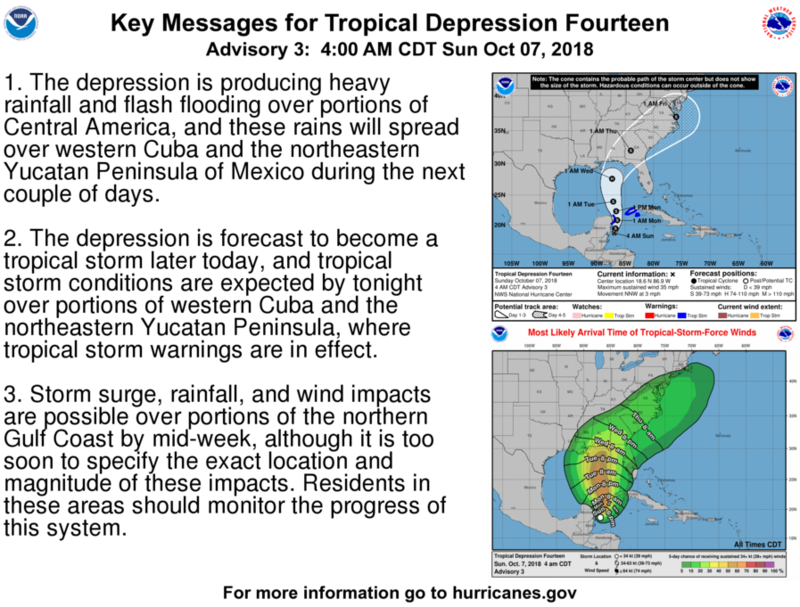 Tropical Depression 14 has formed and there is a Tropical Storm Warning for the Riviera Maya. 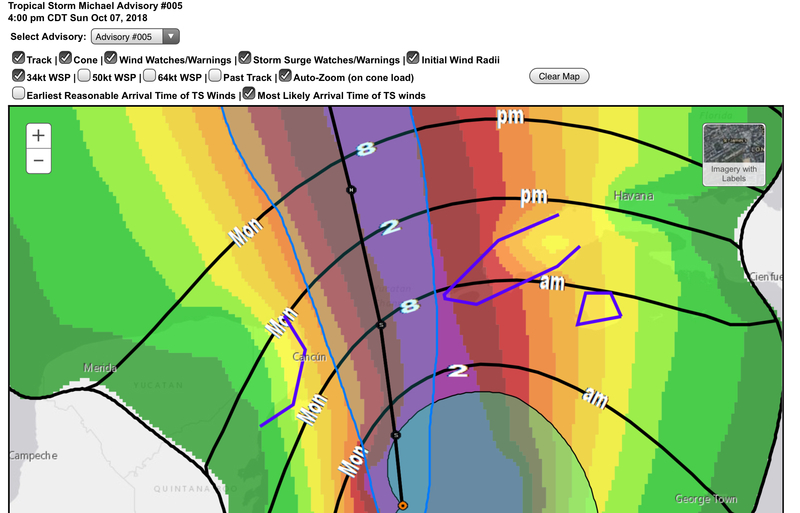 The depression is moving toward the north near 3 mph (6 km/h). This general motion with some increase in forward speed is expected over the next few days. 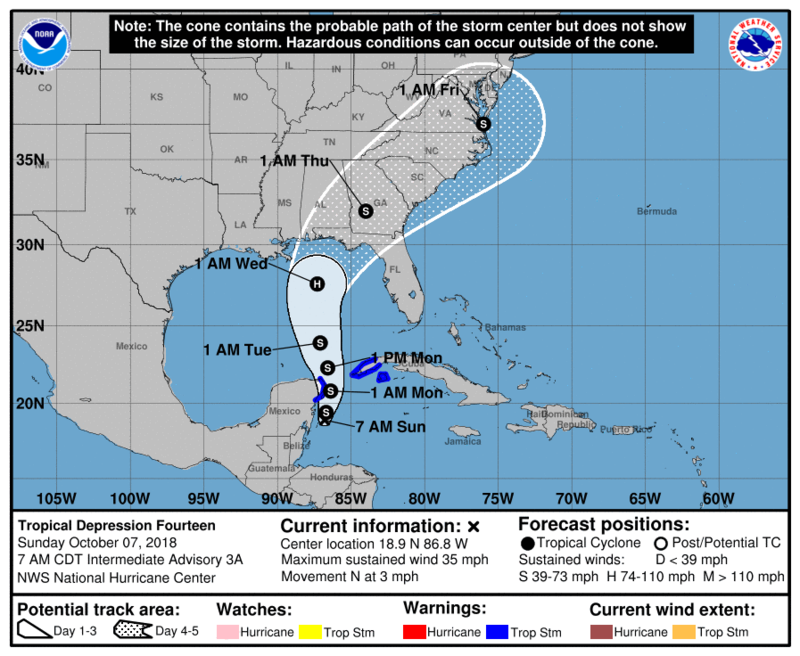 On the forecast track, the center will move through the Yucatan Channel Monday morning and then across the eastern Gulf of Mexico late Monday through Wednesday. Maximum sustained winds are near 35 mph (55 km/h) with higher gusts. Some strengthening is forecast during the next several days, and the depression is expected to become a tropical storm later today. 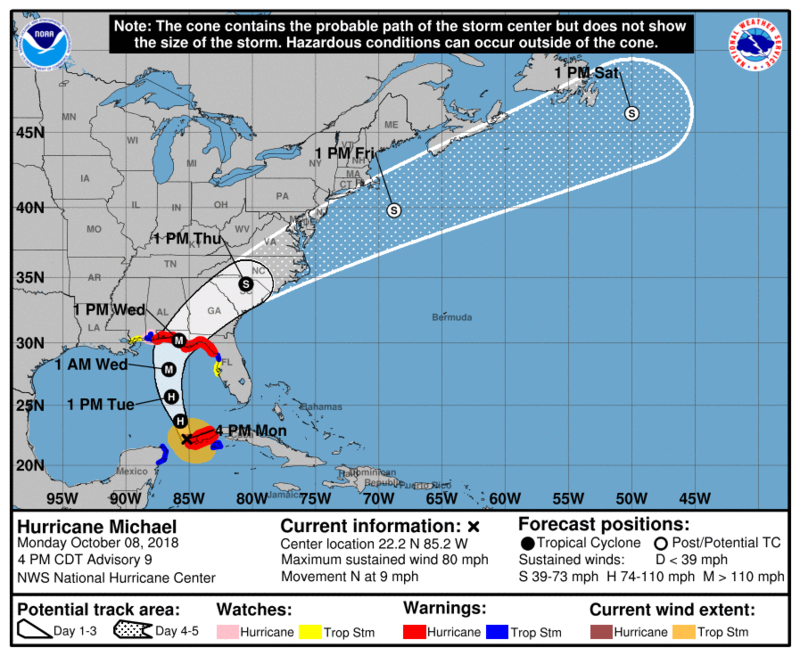 The system could become a hurricane by Tuesday night or Wednesday. 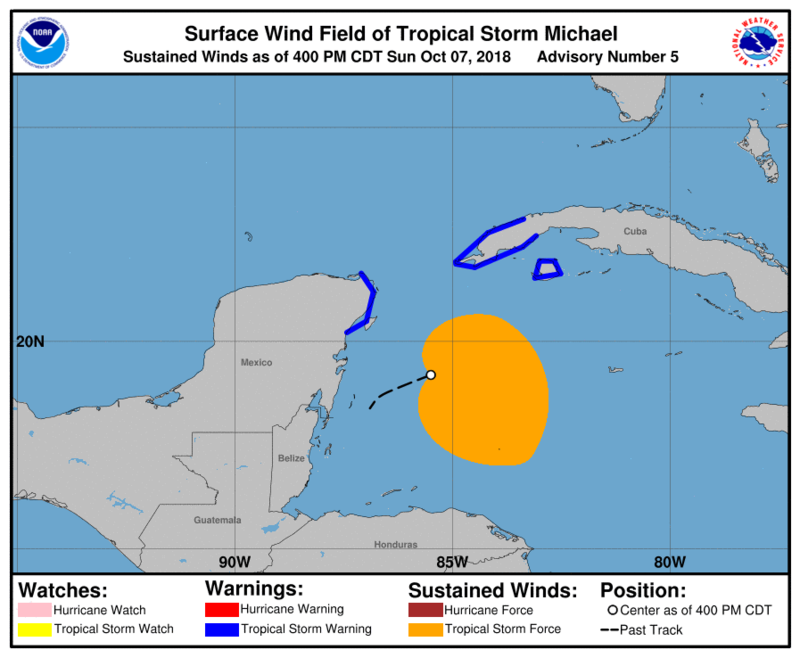 WIND: Tropical storm conditions are expected to first reach the coast within the warning area by this evening or tonight, making outside preparations difficult or dangerous. 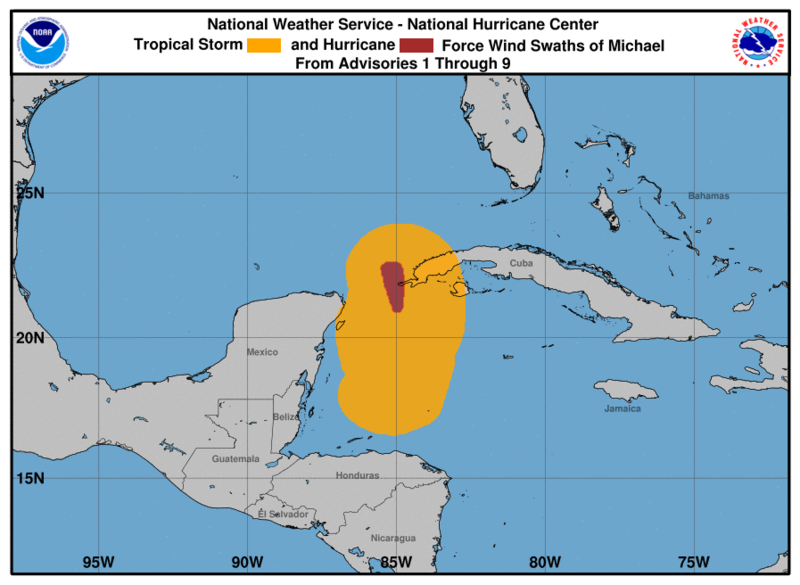 RAINFALL: Total rain accumulations of 3 to 7 inches are expected over western Cuba and 2 to 4 inches over the Yucatan Peninsula, Belize, and northern Honduras through Tuesday. 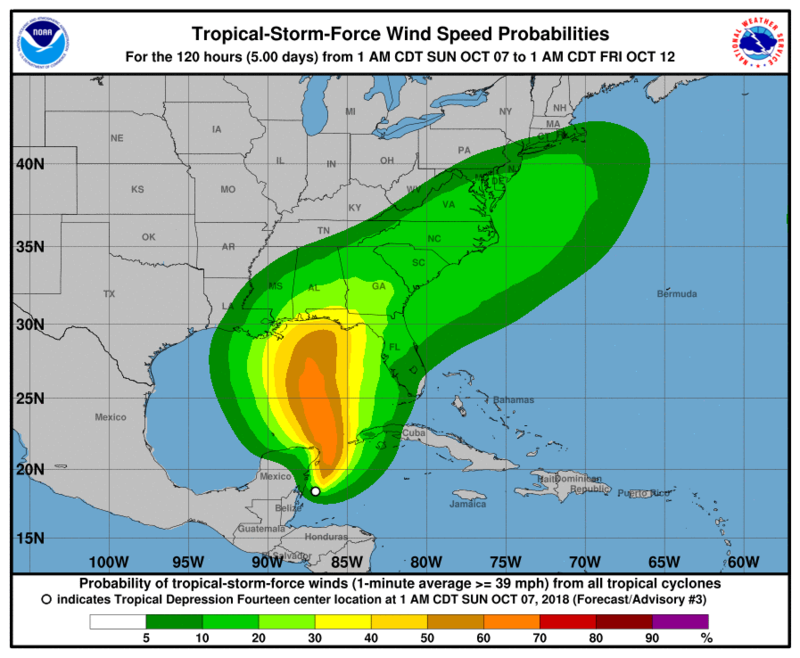 Now about 20-50% chance of tropical storm force winds along the Riviera Maya (greater chances further north). 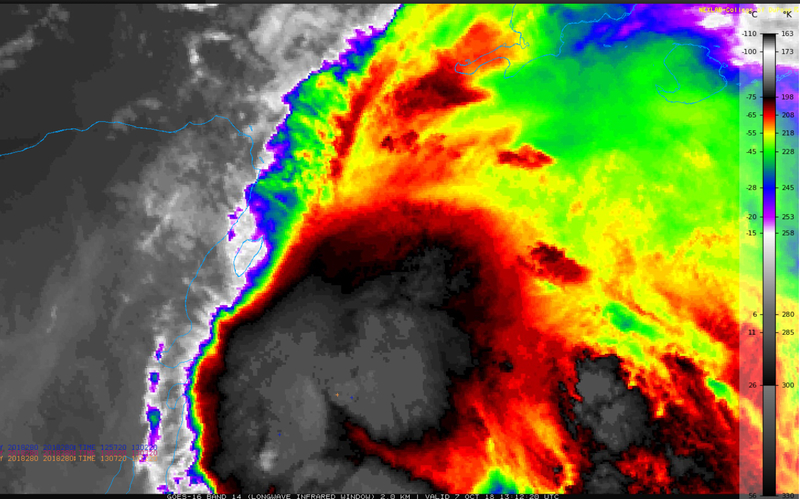 Here is GOES-16 IR image from 8:12am. Click here to see loop. And visible loop is here. Key amessages from NHC at 4am advisory. 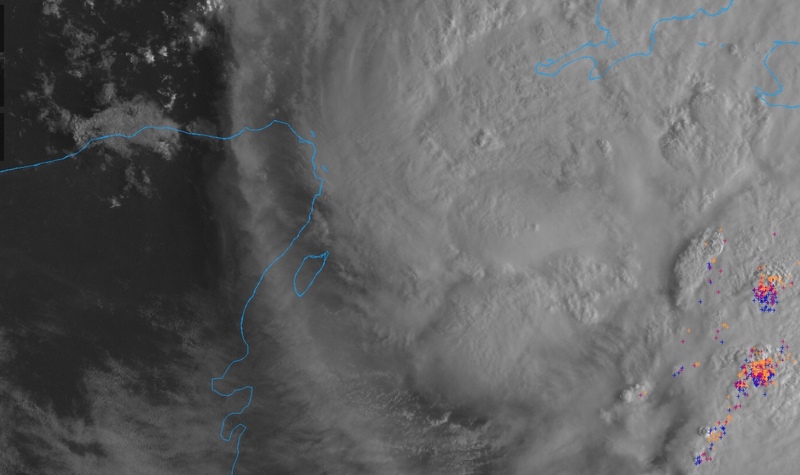 Arrival of strongest winds in the Riviera Maya should be later this evening and over night. Expect on and off heavy rain next couple days. 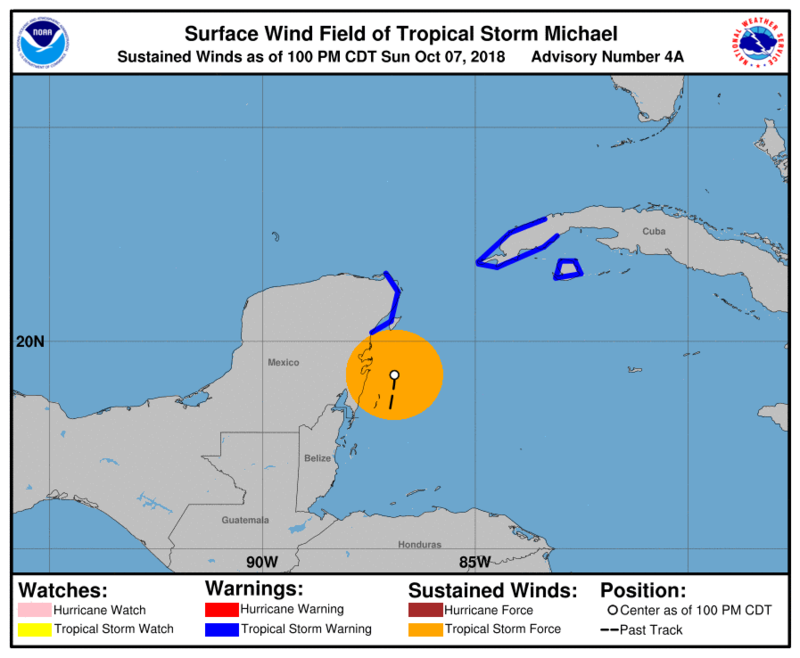 Tropical Storm Michael forms off Riviera Maya coast. 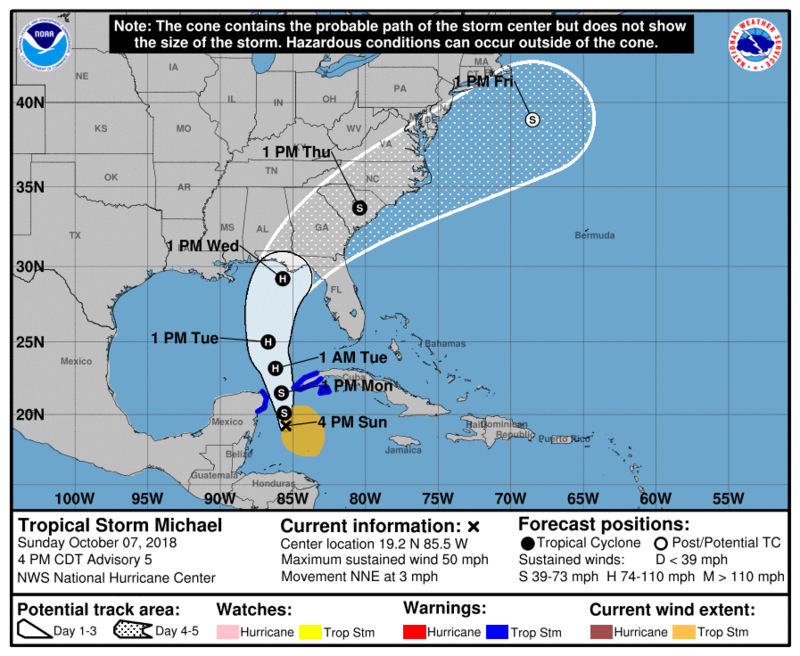 Get latest updates from the NHC. Here is extent of tropical storm force winds as of 1pm. 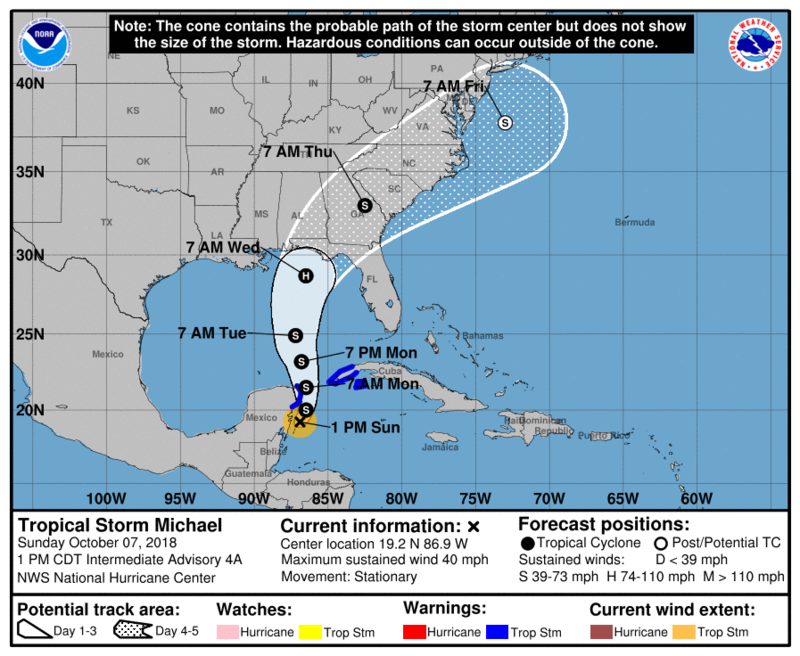 Tropical Storm Michael’s center has reformed farther east. Maximum winds now near 50 mph. Here is extent of wind field…strongest winds well offshore. 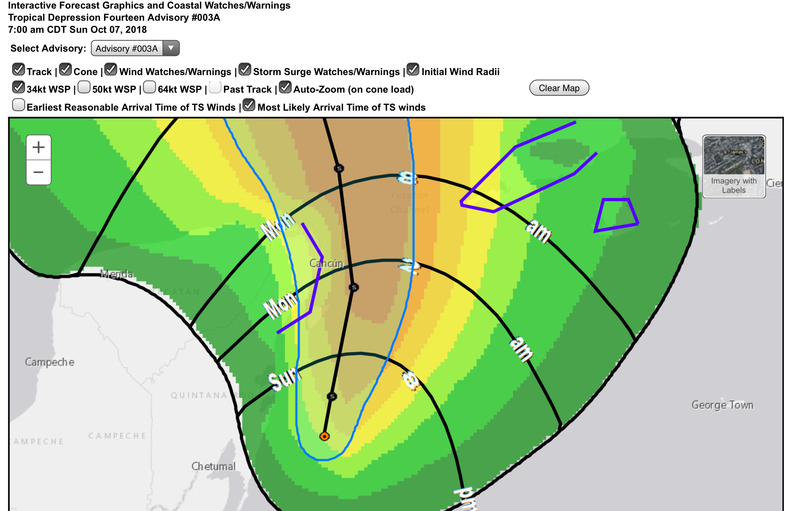 Below is from the NHC interactive map. Here is 7am update from NHC. Looks like we dodged the bullet. Only forecasting 1-2 inches of rain for Riviera Maya and maybe tropical storm winds in extreme northeast Yucatán Peninsula. 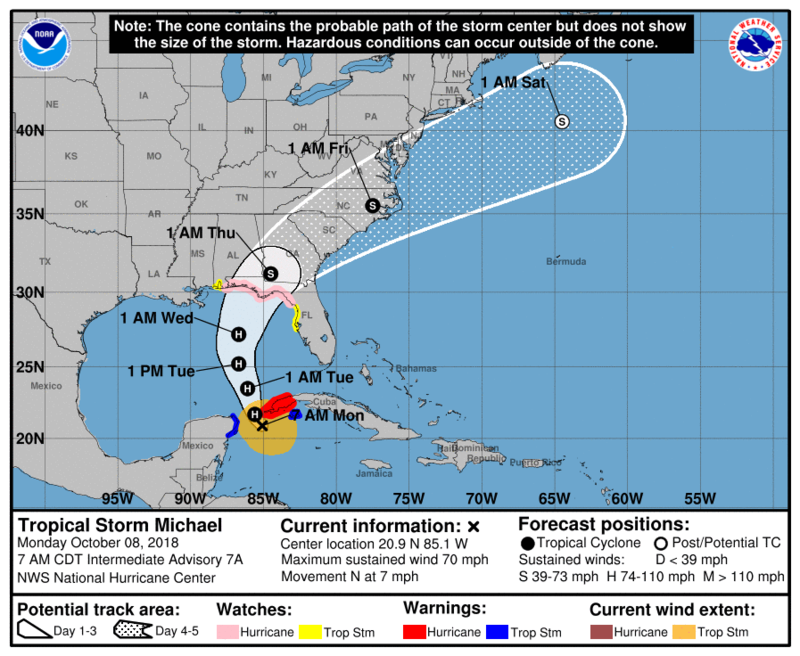 Michael now a hurricane and expected to be a major hurricane by the time it makes landfall on U.S. Gulf Coast. 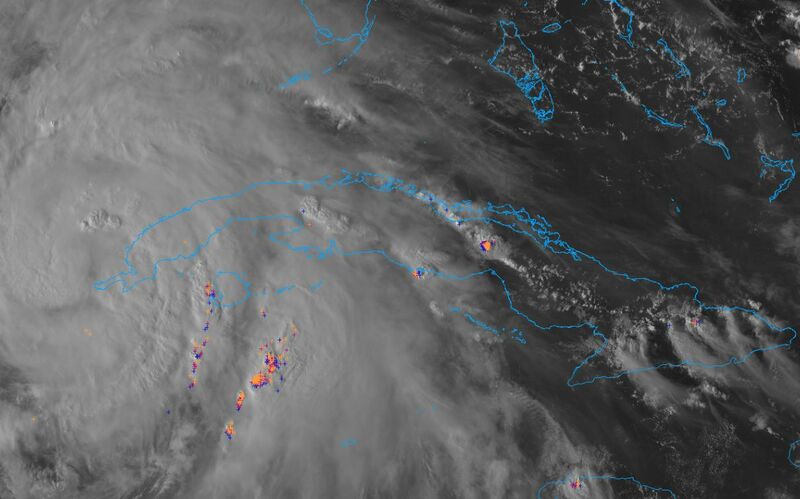 GOES-16 visible image from 4:30pm today. Click on image to see loop.